The rod doubled, and it was all Jack could do to hang on until his big brother Jimmy got over to help. Then our friend Jacob grabbed on too. 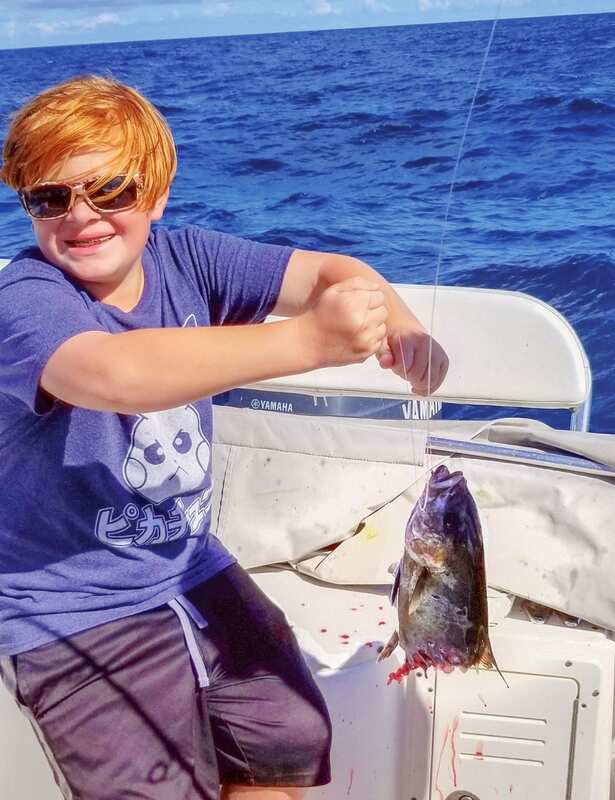 Jacob on the front grip of the rod, Jack in the middle—reeling for all he was worth—and Jimmy on the rod handle. It was quite a sight as they worked together to reel something up from the dark blue 115 feet below. They managed to get the fish up for a bit, but then the rod bowed hard. Now it was pulling line and leaving the boat behind. With a magnificent pull, the line suddenly went slack. Jack’s fish had been sharked! All that was left was a head. The fight hadn’t lasted long, but man it was exciting! This was on a business trip from Georgia through central and south Florida, during which I hoped to squeeze in some fishing. In speaking with a customer about Purge Right purging compounds, the conversation inevitably turned to fishing. I told him I wanted to catch peacock bass and Mayan cichlid. He informed me that the canal across the street had both. That was great news! Before heading to Florida, I contacted my friend and Florida local Chris Dean. He wanted to fish, too. My friend Eric Crowley, who guides in Georgia but fishes a lot in Florida, clued me in to some good locations. We were set. I met Chris and his son Jack at the canal, and we caught Mayan cichlids until dark. We had a blast. It’s like bream fishing back home, only much more colorful. That evening over supper, when the boat Chris and I hoped to fish from fell through, my dreams of catching giant snook vanished like ice cream on a hot day. I spent the next half hour texting and calling captains. Nobody had any openings the next day. Later, Chris’s other son, Jimmy, called with some intel on bank spots where we might catch peacock or snook. Jimmy was MIA the next morning, but when he finally called he had come through in a big way. His buddy Jacob had a boat ready to go chase snook. All five of us—Jimmy, Jacob, Chris, Jack and I— loaded up and headed through the mangrove jungle with a tank full of bait. As we passed the inlet, we noticed the waves didn’t look too bad seaward. We decided to ride out and see how it was. So glad we did! We caught the jack that was sharked as well as several snappers, triggers, cobia, amberjacks, and a remora that latched onto the side of the boat when we tried to release it. 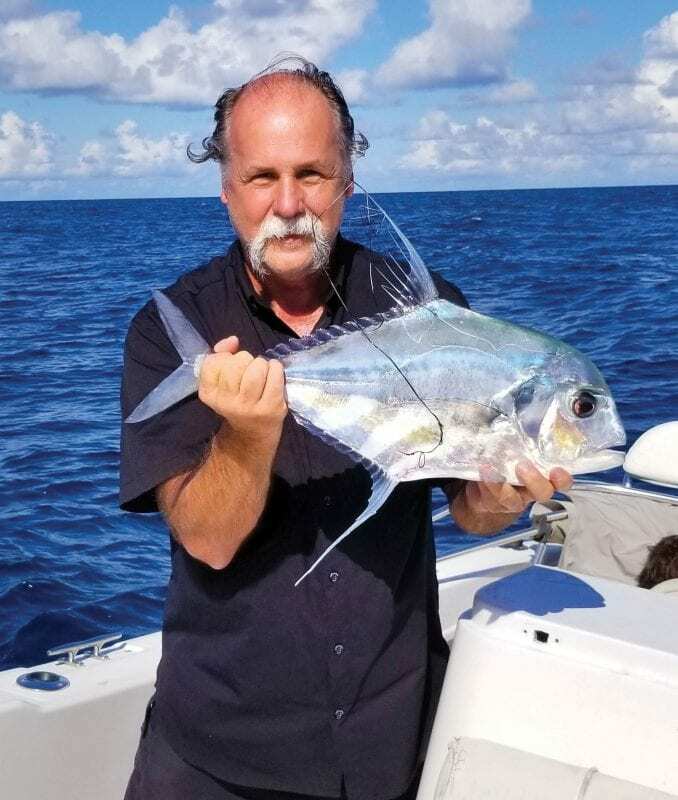 I also caught my first African pompano. As I drove back to Georgia the next day, I daydreamed about my next business trip to West Palm. I hope Florida folks realize how good they’ve got it.